I've rescued a lot of boats over the years, to some extent because I have a much more reliable boat than most people, also because in remote areas of Alaska there's an implied responsibility to come to the aid of disabled boats/people. This season I got involved in two rescues — one of a kayaker with a leaking rental boat on a rainy and windy day, another of a disabled, marginal boat manned by a marginal crew. I had been poised to start a tent-camp outing on an island in the middle of Prince William Sound that has no bears. I had been waiting seven days for fair weather, but on getting a report that yet another long spell of wet weather was forecast, I decided to sail to Valdez and resupply, an activity that doesn't require the sun to be out. The first travel day I anchored in Sawmill Bay, about two hours from Valdez, which would let me arrive in Valdez early the next day, get fuel and shop. I was the only boat in the bay. After a few hours of reading I heard someone calling me — it was a German tourist in a rental kayak who asked for a weather report. I should say again that there's been much more rain in Alaska in recent years, resulting from global climate change, a topic discussed in more depth on this article set's introductory page. This woman had flown over from Germany a number of times over the years and kayaked from Valdez to Whittier, which to me was a rather ambitious kayaking/camping expedition and evidence of her personal fortitude. I reluctantly gave her the bad news — the forecast called for at least several more days of rainy, windy weather. She thanked me and paddled away to her campsite on the far side of the bay. I felt very sorry for her. Two hours later she called me again, woke me up and explained that her kayak was leaking, gradually filling up the boat's single largest compartment and soaking all her gear as well. This time I hauled her kayak up out of the water and repaired a rather obvious leak with duct tape. I gave her a supply of duct tape so she could perform some more repairs on her own if she decided to continue her outing. While repairing her boat I thought about several things. One, a kayak rental outfit that doesn't periodically inspect and repair their boats doesn't deserve to be in business. Two, she had the option of paddling back to Valdez in a day rather than trying to wait out the weather and carry on to Whittier as originally planned. But she had come all the way from Germany for her annual wilderness outing, and to return to Valdez would prematurely end her trip in which she had invested so much. Again, I felt sorry for her but her prospects weren't very good. In good weather conditions and with an experienced kayaker, the paddle from Valdez to Whittier is challenging but manageable, with many long stretches along the coasts of islands (relatively safe and interesting) but a few long stretches of open water that, if it gets cold and/or windy, can be quite dangerous — if the kayak rolls over and the wind is strong enough, it can be difficult or impossible to get back in the boat, after which hypothermia becomes a serious risk. And hypothermia is complicated. I've rescued boaters in various situations, but I've never had to deal with a hypothermia victim. I've decided how I would deal with it — if I found out that a person had been in the water more than a few minutes, rather than try to perform hypothermia first aid, I would call the Coast Guard for extraction to a hospital. The reason? With hypothermia, many "common sense" remedies backfire. For example, it's possible to seal the fate of a hypothermia victim by trying to warm them up too fast, because of an effect called "afterdrop". At this point when writing articles, in years past I would quote a famous story about 16 Danish sailors who were rescued after their fishing boat sank in the North Sea and given hot drinks by their rescuers, after which they all died — but it turns out this story may be a myth. I didn't take any pictures of the kayaker or her boat — it would have seemed presumptuous and inappropriate. But in retrospect it would have been useful to have a picture of the bottom of her rental kayak before and after the duct tape repair, so people would know what kind of equipment they might be stuck with on an expensive Alaska field trip. As to her implicit expectation that I would want to help her, that was a given — who would refuse to help someone in her circumstances? Besides, she wasn't a complainer and she had a lot of courage, so I was happy to help. But as the next story shows, being a rescuer isn't always a pleasant experience. Ironically, a few weeks later in almost the same neighborhood — Sawmill Bay — I heard someone calling for help on the radio. The calling boater clearly didn't know how to talk on the radio, ordinarily not very important unless there's an emergency. With the right training, if there's no emergency, a person calls another boat on VHF channel 16, makes contact, and switches to another channel for the actual conversation (to free up emergency/calling channel 16). But you can always detect inexperienced boaters — they either have ordinary conversations on channel 16 until the Coast Guard tells them to change channels, or they call for help in some incoherent way that leaves listeners wondering exactly what's going on. My next rescue was definitely in the latter category. I heard the skipper on channel 16 asking, "Can anyone hear me?" And as I came closer, he started transmitting to a nearby passing boat: "Can't you hear my radio? You're so close!" This was clearly someone who had almost no boat or radio experience. For the record, to summon help on a VHF radio, you say, "Pan, Pan (or "Mayday, Mayday"), this is (name of boat) at (location), we need assistance (reference)." As to those vessels who hear a distress call, in U.S waters it's mandatory to reply and relay emergency traffic if no one else responds to the call. You aren't obliged to offer aid, but you must relay unanswered calls, using the radio call "Mayday relay". Anyway. As I approached the entrance to Sawmill Bay, I saw a small boat dead in the water, and someone on deck was waving his arms. I got within hailing distance and asked, "Do you need assistance?" The anxious reply was most certainly yes. But the jumper cable, attached to my big battery bank and backed up by my running 5 kilowatt diesel generator, wasn't sufficient to start his engine. So, even though this is a very common failing in small boats, it seemed his battery wasn't the problem. I tried to persuade the skipper that the engine needed to be in neutral for this to work, but he explained that his engine's transmission didn't have a neutral, just forward and backward. I had never heard of such a thing, but because I won't put anything past small boat builders, I didn't object. Parenthetically I have to say when this person wasn't talking to me or struggling with his uncooperative engine, he was yelling at his three teenage sons and showing signs of extreme anxiety. He sounded just like he did on the radio — not remotely a calm person. I was beginning to wish I had called the Coast Guard and let them deal with him. All this noise and anxiety meant I wasn't thinking very deeply. If I had thought a bit harder, I would have realized that, because the engine wouldn't turn over with lots of battery power and because the engine was always linked to the boat's propeller, the problem could easily be the second-most-common small boat failure: a line on the prop. After exhausting the possible on-site remedies, I reluctantly decided to tow the boat to town. I asked the skipper to hand me his bow line, the skipper relayed this instruction to his son standing on the bow, and that son hauled out of the water the shredded remains of a line that had only recently been a normal, not to say long, bow line. It turns out the remainder of that line was wrapped around the prop shaft, preventing it from turning — mystery resolved. I started to say something to the skipper's son in a calm, measured cadence about making sure all lines are on board before starting a boat's engine, but the skipper cut me off, started waving his arms and yelling even more loudly than before, at his sons, at his wife, and at nature in general. I was on the verge of disliking this person. As it turns out, the Coast Guard had overheard the original radio conversation and decided to investigate. Just as I began towing the disabled boat, they appeared on scene (see image above) and asked if I needed assistance. 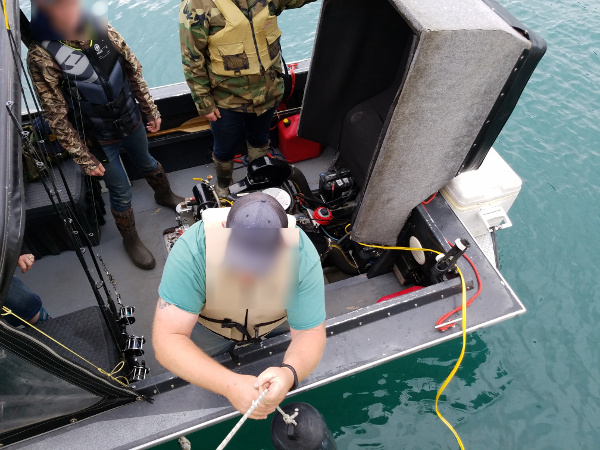 At this point I was more than ready to hand this boat over to anyone else, so I prevailed on them to take over the long tow to Valdez, which they were ready, not to say eager, to do. 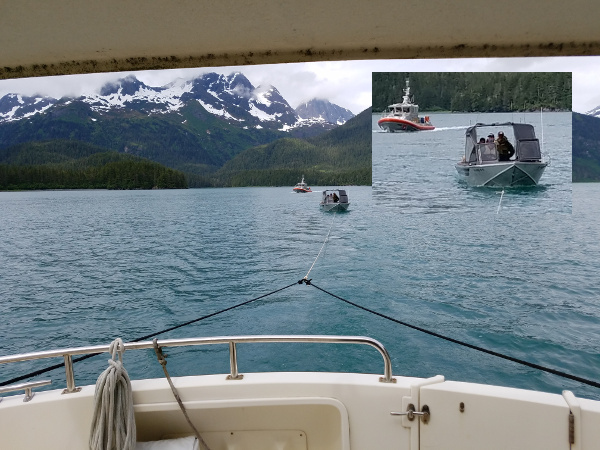 There's a reason the Coast Guard is especially vigilant about boat activities in the neighborhood around Valdez — it's because of the oil pipeline, facilities and the 1989 Exxon Valdez disaster. I think they wouldn't have been so eager to take over for me in most other waters, but I was only a few miles from Bligh Reef, the site of the infamous oil spill. And their intervention was fine with me — my enthusiasm for rescuing this particular boat had pretty much evaporated. Now that I'm selling my boat, I won't be rescuing people quite so often, if at all. Most of my rescues have been of people I thought were innocent victims of circumstance and fickle nature. But this boat was a disaster awaiting any opportunity to unfold.